At windows24.com we offer you a wide range of colors free of charge when the surface area of your order is greater than 25m² for all wood windows and doors in a single color (e.g. RAL 7016 Anthracite gray). Moreover, it is possible to have your wood or aluminum house door in any of the listed RAL colors at no extra coast. RAL colors with a four-digit order number are among the most popular and have been a benchmark in color design for many years. 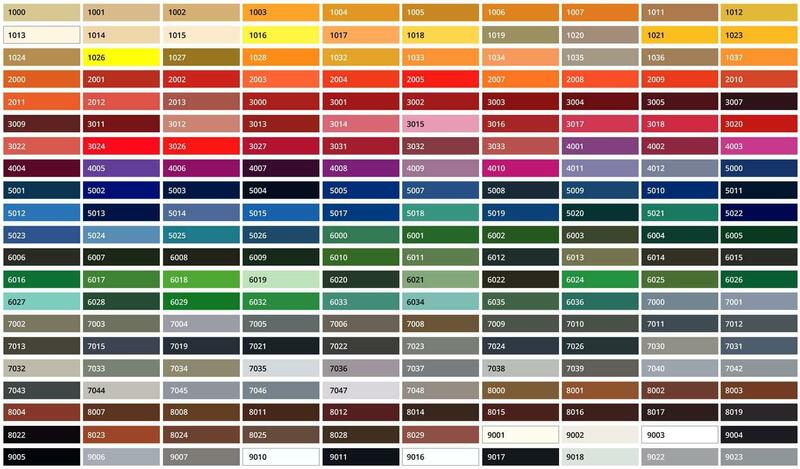 The classic RAL color chart consists of over 200 color variations. The basic collection for matt color shades is the RAL 840-HR color list, and for gloss paints list RAL 841-GL. These two basic lists, RAL 840-HR and RAL 841-GL, also include a wide range of colors which are used by important institutions or are used for special purposes and are of interest generally, e.g. British Racing Green is RAL 6005 Moss green. These color collections cover a broad spectrum. Click on the color for a detailed view. Since 1927, global market leader RAL has specialized in defining and standardizing colors, the results of which are today’s standard in both the private and commercial sectors. RAL also plays an important role for architects, designers and advertising agencies thanks to the precision and the endurance of their color specifications. RAL was the first producer in the world to create and issue a standardized color chart based on water-soluble paints. They offer an extremely wide selection of paints which have been influential in setting modern paint trends. Additionally, RAL paints are characterized as being environmentally friendly and simple to manufacture. Whether varnish or RAL paints we are supplied exclusively by specialized suppliers or directly from the manufacturer. Colors used for camouflage purposes are not included in the RAL CLASSIC collection and are listed separately. For example, the colors used by the German army are typically bronze-green 6031 F9 and 6031 HR. Other camouflage colors include 8027 F9 leather-brown and 9021 F9 tar-black. All RAL colors have been integrated into the RAL DIGITAL software. The digital CLASSIC, DESIGN and EFFECT RAL color ranges offer almost unlimited creative possibilities and is available as both computer graphics and as CAD program. The term color tolerance means the permissible deviation that the supplied paint or the delivered item can have compared to the RAL color specification. End-users who order large amounts of RAL paints have the advantage of having skilled and specialized staff at their side who can inspect the paints. In addition, professional staff lay down binding limits when it comes to the individual colors. Customers who order smaller amounts of RAL paints often do not have the special equipment necessary to assess the colors. Smaller companies frequently work as sub-contractors and it can sometimes happen that the final combination of parts have different colored surfaces. This primarily affects manufacturers of metal construction parts who either paint the metal parts themselves or who order them pre-painted. Color differences can sometimes arise due to the particular surface structure of the material. The method used to apply the coat can also have an effect on the color appearance. The appearance of a particular color applied via spraying is not always identical to when applied using powder coating techniques for example. Unfortunately, limiting the number of RAL colors does not necessarily help, since some color deviation is tolerated in certain product areas. In order to avoid color deviations, it is best to order from suppliers who have the special color measuring equipment at their disposal.